The overall goal of this online Physics I class is to provide the student interested in the health professions with an introduction to physics that emphasizes the concepts that are the foundation of sciences, which the students may encounter in their professional studies. Physics I emphasizes a modeling approach to the principles of physics. Modeling instruction emphasizes hands-on observations, data collection and analysis so students may construct mental physical models describing the world around them. Students will then practice their understanding through extensive written and online homework problems supported by video lectures and extensive readings. The accompanying text provides applications of mechanics to a variety of biomedically-rich examples reinforced by online homework activities. Students will test their understanding through online quizzes before taking exams. UNE’s online Physics I class, PHYS 1010, provides an in-depth examination of basic mechanics including the study of motion (kinematics), interactions and forces (dynamics), energy, impulsive forces (collisions), circular motion, and fluids. Click here to see the full physics for the health professions course outline. The laboratories that accompany Online Physics I for the Health Professions contain the same learning objectives as any Physics I Lab, accomplished on any college campus, except that students work at home. The Online Physics I Lab provides a “hands-on” guided inquiry experience that focuses on fundamental concepts essential for proficiency in physics of the life sciences. Students make predictions based on observed relationships, obtain data to test their predictions, and develop a variety of generalized models representing their conclusions. The representative models are then applied extensively to situations based on similar physical principles to help develop proficiency. An emphasis is placed on understanding the concept behind each Online Physics I Lab and use of the scientific method required by today’s healthcare professionals who are expected to have a general understanding of how science and the scientific method contribute to their profession. Homework exercises are designed to provide students with practice to solve physics problems. Online exercises are designed to integrate physics concepts with common health science applications. Like the online quizzes, the problems provide quick formative assessment of student understanding. 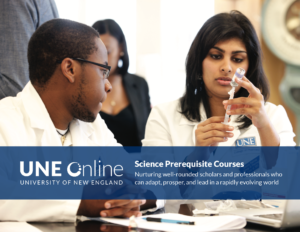 The laboratories have the same learning objectives as UNE’s on-campus introductory college level physics courses for pre-health science majors. The labs have been developed specifically to meet the requirements for successful entry into the health profession, in particular to pass the physical science portion of entry exams such as the MCAT. Students receive a state-of-the-art handheld device that contains a variety of instruments to perform experiments and collect data. Following the course instructor’s introduction for the laboratory, the student sets up the appropriate lab experiment and undertakes the experiment. The student will develop mental models from the hands-on activities. The student starts by making a prediction and obtains experimental data relevant to that prediction by making measurements in real time. The student analyzes the data obtained, draws conclusions and makes applications. A quiz concludes each unit. Students will participate in graded discussion boards, complete the online homework and take quizzes. The is a midterm exam and a final exam. Working at the pace typical for a four semester hour course, the average student will complete this online Physics I class in approximately 16 weeks. Many students are nontraditional students who have elected an online course for flexibility. Since the course is self-paced, you may complete the course in fewer than 16 weeks. Students will need a minimum of one semester of college-level Algebra and background knowledge in Trigonometry.